The new Chelsea operating system was rumoured from the turn of the year, a club notorious for the fast turnaround it has on producing new software. The product itself only came out for public use in July, Mourinho 2.0, has been a clear upgrade on its predecessor (Interim Dross) and was critically acclaimed even before release. It has been a fan favourite with the Chelsea community thus far and looks set to be even more popular than the initial system. In our review of Mourinho 2.0 we take a look at the positives, the negatives and what we can expect from the upcoming update (2.0.1). Making Oscar the key component. A lot is made of who or what is a “Mourinho” player, Oscar by and large ticks every box. Technically brilliant, relentlessly tenacious and more importantly, a desire to succeed. After a promising start under Di Matteo, Oscar’s influence faded as Benitez forced him into a more unnatural wide role, few can begrudge the manager choosing Juan Mata as the focal point of the team but the Spaniard has been equally effective out wide in his playing career, Oscar on the other hand visibly wasn’t. 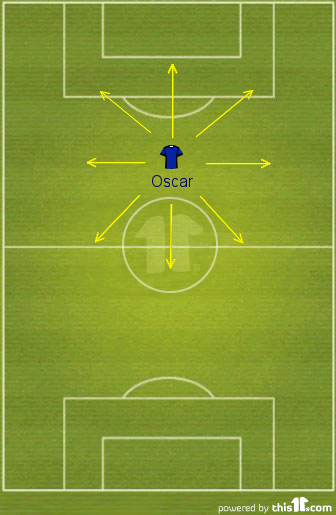 The second coming is only four games old but one of the more evident tactical changes has been Oscar’s berth in a more central role, similar to that which he is deployed in by Brazil. He’s been the season’s outstanding player so far, heavily involved in the majority of the positive play that the club has enjoyed. A delightful first touch is accompanied by a sixth sense of what is around him, his vision and execution has been near flawless. Yet that isn’t the reason Mourinho seemingly favours him in the central role, that is more likely due to his willingness to harass and press the opposition midfielders. For all of Juan Mata’s brilliance (and there is plenty of it), he can often be lazy in his defensive duties, the issue with this is that it allows the opposition to dominate the midfield area. Given that Chelsea’s midfield is no longer the elite machine it was five years ago, it needs all the support it can get from those players in an attacking position, Oscar is tactically aware and appears to enjoy his defensive responsibilities, despite his slight physique. In a position that Chelsea are thoroughly blessed with, Oscar’s ability to keep the team’s shape intact when defending gives him a clear edge over his competitors. Hours of writing can be dedicated to the brilliance of Oscar himself but I will refrain, this time. To sum it up – Oscar is everywhere. One of the biggest worries from the previous system, was the rate at which the club would not only concede goals but chances. Petr Cech’s best season since his head injury saved many blushes throughout last season. The keeper has maintained a staggering level of consistency and has started the season once again in spectacular form. He has however been troubled far less so far this season, the Manchester United game being prime example as the Blues conceded only 3 shots on target, which were all comfortably dealt with by Cech. It is a fulcrum of a Mourinho system, the team operates on the basis of preventing the opposition any chance and aims to stifle the opponent’s strength. The club’s strong start was in spite of its best defender, David Luiz sidelined with an injury that he picked up in pre season. Terry who was plagued with injuries last season and Gary Cahill who suffered a severe dip in form have both had solid starts to the new campaign. Cahill in particular already seems to be showing signs of Mourinho’s tutelage, frequently found square on last season with strikers running off him with ease, Cahill has been far more wary of the danger posed by attackers and is now more aware of his surroundings. One of the contributing factors to the club’s efficient defence so far has been the willingness of the wider players to help their full backs avoid two on one situations and a high/quick pressing game has given opponents little time to build attacks. There was a tale about Balotelli being told by his mother to go shopping for cleaning products and he returned with amongst other non cleaning products, a Scalextric set. That’s a rough analogy for Chelsea’s transfer window, it hasn’t been as practical as most hoped but it has been entertaining. No true holding midfielder was signed, neither was the centre back position strengthened and the malnourished strike force has had promising young Belgian starlet, Romelu Lukaku loaned out. Samuel Eto’o has indeed come in, the 32year old is one of the most decorated footballer’s in world football but a two year adventure in Siberia (not really Siberia) begs the question whether he can cut it at the highest level again. Instead of targeting areas of concern, Chelsea have decided to strengthen the positions in behind the striker, the same positions that Oscar, Mata and Hazard occupy. De Bruyne’s retention and the addition of Andre Schurrle and Willian add immense depth to an already star studded cast. Similar to Manchester United’s signing of Robin van Persie, Chelsea have strengthened the area of the field they were strongest in. 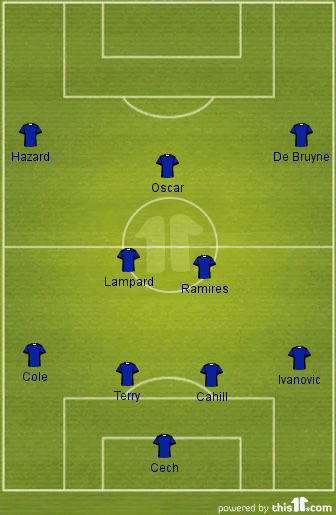 The approach ensures the likes of Mata and Oscar won’t suffer a burnout having to play 70+ in a season. Chelsea will hope the chemistry develops quickly between the players, their interchange and fluidity will be key to a successful campaign. Chelsea’s strength is no doubt their endless raft of creative midfielders, yet their effectiveness is reliant on how quickly the midfield in behind them can get the ball to them. Lampard and Ramires have been tasked with the job in all four of Chelsea’s games and barring a dominant first half display against Hull, they’ve failed to impose themselves on games in any sort of attacking capacity. Mourinho 2.0 has instilled discipline in their defensive duties but the Bayern game showed that they are far from providing the shield that Makelele did during the initial years of the Abramovich Era. Lampard has shown marked improvement since he initially took on a deeper role, his positioning and awareness means that he is far more adept in his understanding of his duties. However, deteriorating physical attributes are at times highlighted when the opposition can pass the ball around swiftly as he is bypassed. Ramires on the other hand arguably has the best ‘engine’ in the league but his decision making has been left wanting, coupled with his sub standard passing range it is a combination that has yet to impress. Don’t let the stats fool you. Against Aston Villa it was said that Ramires completed 90% < of his passes but a startling amount went backwards and his failure to make a decisive pass to the front four was evident, stalling and delaying even when a window presented itself casts a doubt whether he is the suitable candidate to play in a system that requires fluent passing. There are claims that the Chelsea set up isn’t accommodating for a striker to be prolific, rather it is targeted at the attacking midfielders to virtually do everything. A strange conclusion when you consider, two of the leading five players in the assist charts in Europe were Chelsea players. Long term targets, Cavani and Falcao both were sold during this transfer window and to many fans astonishment, neither ended up at Stamford Bridge. Instead, both South American hitmen (No, they aren’t gangsters) opted to ply their trade in France as the offers submitted by Chelsea fell short of the valuations placed on the pair. Hope was however restored following a promising pre season from Romelu Lukaku but in the first few games his playing time was limited and now he’s no longer at the club this season. The other two strikers that have seen minutes on a football field so far this season have inspired little more than despair and resentment towards the club’s transfer strategy. Fernando Torres remains unable to even act like a footballer that remembers what to do with the football and there are reports that Demba Ba may never have known what to do with it and was just rather lucky to rack up the number of goals he did at Newcastle. The Senegalese’s time at Chelsea has been one of a scorer of great goals as opposed a great goal scorer, meanwhile Torres remains, predominantly, a flat track bully. With any new operating system, there are patches that need to be released to fix the initial bugs that are found. Mourinho 2.0.1 is expected to arrive following the International break, so what changes can fans expect? David Luiz’s return gives Chelsea some much needed pace along the back line but perhaps more importantly given the impotence of Chelsea’s central midfield in being unable to get the ball to the danger men with any sort of urgency, Luiz provides remarkable passing ability and range from a centre back role. Many questioned whether the Brazilian, whilst being a popular feature in previous systems, would be returned for Mourinho 2.0, his injury made for an easy news story to link the player with a move away but Mourinho insisted on the importance of his inclusion. Now fit again, Luiz provided a quick glimpse of what he brings to the team as a defender by stifling a potent Bayern attack for vast periods of a game before providing a brilliant defence splitting pass into the path of Eden Hazard to set up the Belgian’s goal. The ball playing ability of Luiz will be a welcome relief to those in front of him as they can expect better service from now on. As mentioned earlier, Ramires and Lampard have started every game so far in the centre of midfield, a surprising occurrence given the depth Chelsea have at the position, even more so given that Mourinho was adamant he felt Frank Lampard could no longer endure the trials and tribulations that are associated with a full season of football. Cameo appearances from Marco van Ginkel have been promising, the young Dutch international has an air of Michael Ballack about him in the way he carries himself. Assured on the pitch and seemingly in total control of the ball, van Ginkel looks a future star but given the lack of productivity from the current starters, a chance may well be offered to the player to prove that he’s ready now. His ability to distribute the ball and maintain a swift tempo in the passing game could well be indispensable to the club, his size and strength gives him the perfect build to be combative in the centre of the park and perhaps a dominant force for years to come. Another returning loanee and Mourinho favourite is Michael Essien, the once imperious midfielder had a very strong pre season leading players and the manager to claim that this was the best shape Essien had been in since his crippling knee injuries which saw him miss the majority of two separate seasons. An Essien that can rediscover a fraction of the player that once reigned supreme in the centre of the field will be essential to any challenge Chelsea lodge for silverware. Athleticism and technical ability married into a dominating physique can provide the impetus for drives going forward. A knack of breaking up play and a frequent catalyst for attacking play, Essien could be the solution to Chelsea’s midfield dilemma. Oh, and there’s always John Obi Mikel. The consistent performer in the centre of the park, Mikel provides stability defensively and a solid foundation to build from. Rarely given the opportunity to shine for club as he does for country, Mikel’s performances (barring Benitez’s tenure) have been grossly underrated. The troubles those competing for a berth up front have been noted and are only likely to be exasperated if they are followed with similar performances. The signing of Eto’o has been met with mixed reviews, on one hand he represents the polar opposite of the club’s recent transfer policy in finding highly talented youth players that will be the club’s future for years to come. At 32, Eto’o is a seasoned veteran and this has also brought worries about whether he is the same striker that won consecutive trebles with Barcelona and Inter, he could well join a list of high profile strikers that have failed to emulate their form for previous clubs when at Stamford Bridge but at the same time it has only been two seasons since he scored 37goals for Inter Milan in what was a dire season for the club. Eto’o was at one point the world’s most feared front man and if he can replicate any sort of form close to his prime he will be the club’s best option up front by the proverbial country mile. He’s a striker that knows how to lead the line on his own and a striker that knows what is required of him when there’s plenty of creative in behind him, something both Ba and Torres have seemingly failed to get to grips with. Eto’o should be able to not only run in between the lines and draw the attention of opposing defenders but he’s skilled enough to drop in deep and link up with the midfielders, allowing them to run into the free space that will be created. A short term option, unlike most Chelsea recent signings but Eto’o looks set to be one of the most influential ones if allowed to fire.